It seems misleading to subtitle the latest Star Trek prequel “Beyond” because the movie doesn't really go beyond anything in terms of its genre, story, characters or the traditional Star Trek mythology. 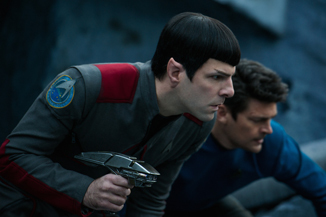 Like its reboot predecessors, Star Trek (2009) and Star Trek Into Darkness (2013), Beyond settles on delivering the type of narrative and action we've seen time and again, and the result is a technically pleasing yet ultimately uninspired space adventure. If it was an episode of the classic Gene Roddenberry TV show, I imagine many fans would consider it “filler material” in between the greater, more consequential developments. And yet, just like the other prequels, Beyond has its virtues. It's basically sci-fi comfort food. On the outside, it's slick, charming, and genuine at times, and the actors make their characters perfectly convincing and likable. We also marvel at the special effects and sharp, expansive imagery that fills the entire screen, even in the far corners. The screenplay may not give us a lot to think about, but the visuals certainly give us plenty to gaze upon, often with wonder, and so the movie at least holds our attention. But, in the end, its superficial qualities only go so far, and because they are so strong with these movies, it's even more of a shame they don't have a deeper, richer substance upon which to attach themselves. Once again, the conflict is rather simple and watered down. The men and women of the starship Enterprise do battle with a new, bitter villain named Krall (Idris Elba), a supposed alien commander who has intentions to destroy the Federation's latest space station and then the entire Federation itself. A troubled past has left Krall feeling betrayed and vengeful, but any more about his motivations or who he really is I cannot say at the risk of giving away crucial details. Just know the big “reveal” at the end isn't as revealing as we hoped. In the grand scheme of things, this is just another stock “villain who wants to destroy all that is good and humane” type of plot. I wish I could say it's more complicated and involving than that.